Abby, Amanda, Amy, Andrea, Andrew, Ann, Ashley, Barb, Barbara, Barry, Beth, Bill, Billy, Buddy, Burl, Carla, Carol, Cathy, Charlie, Cherie, Chris, Chuck & Alice, Daniel, Darlene, Dave, David, Dean, Debbie, Del, Diana, Diane, Ella, Flo, Florian, Fordham family, Frances, Gail & Hal, Gary, Gene, Gerry & Kathy, Heuple family, Hilda, Holly, Jan, Jane, Janet, Jeff, Jen, Jenn, Jerry, Jim, Joan, Joe, John, Josh, Joyce, JR, Judy, Julie, Julietta, June, Karen, Kathleen, Ken, Kenneth, Layne, Lenny, Libbie, Lilly, Lincoln, Linda, Lindie, Lisa, Marciene, Margie, Marilynn, Mary Lou, Merlin, Michelle, Mike, MK, Nancy, Paul, Paula, Pauline, Peg, Peggy, Peter, Phil, Phyllis, Ray, Reg, Richard, Rosa, Samuel, Sarkees, Scott, Sean, Sherry, Doug & Sally, Steve, Sue, Susan, Suzanne, Terry, Tomi, Tony, Torry, Vanna, VickyeVivian, Walker family, and Yancey. We continue to pray for those seeking employment, college students, travelers, the people of the Gulf Coast states, California, Puerto Rico, the US Virgin Islands, Las Vegas, those impacted by natural disasters, rescue workers, those dealing with mental illness, our elected leaders, military families, immigrants and the people and communities affected by violence. Handmade items by our Crafts for a Cause group will be for sale. 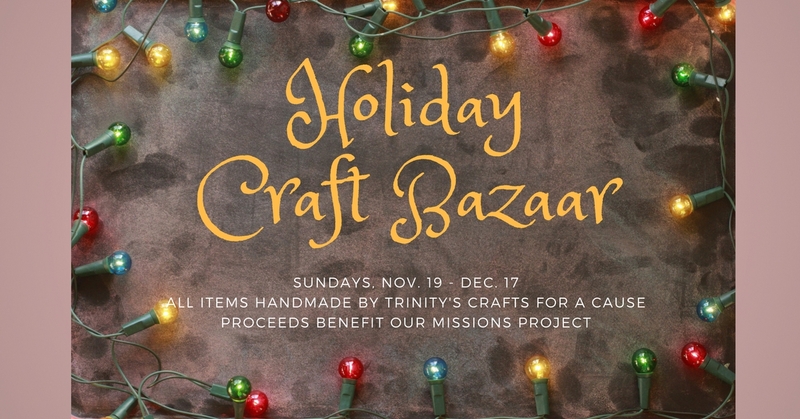 Shop for the holidays with a real purpose: supporting Trinity’s Crafts for a Cause ministry for the coming year. Blue Christmas: A service of reflection for those facing loss this holiday. Our service will be in the Chapel on Wed., Dec. 20 at 7 p.m. Advent Study: Pastors Jim Sprouse and Eileen Gilmer will each offer an Advent Study this year. Because of Bethlehem, a study by Max Lucado meets with Pastor Gilmer in Room 302 at 9:30 a.m. Pastor Sprouse will lead Down to Earth by Mike Slaughter on Sundays at 9:30 a.m., Mondays at 10 a.m. and Wednesdays at 6:30 p.m. beginning Dec. 3 when the current course of Disciple Fast Track is completed. Angel Tree: The Share Angel Tree is in the Narthex with gifts tags and requests waiting to be picked up. Please note the instruction sheets also available under the tree. Gifts are due Dec 3. Crafts for a Cause is opening the annual Holiday Bazaar, today, and continues on Sundays through mid-December after both worship services. This is our sole fund-raising event that enables us to buy the supplies for the next year, so your participation is really important! All kinds of homemade foods and crafts for adults, children and pets will be available, all made by Trinity members. Meanwhile, we continue to work on comfort items for Fair Oaks Hospital on alternating Monday nights from 7 to 8:30 in Room 124. All adults welcome; instruction provided. Upcoming sessions: Dec. 4 and Dec. 18. Contact Molly Sprouse. Hanging of the Greens: On Sunday after the 10:30 service we will decorate the Sanctuary for Advent and Christmas. Everyone is invited to help hang the greens, put up the Christmas trees and set out the ornaments. Martha’s Table: On Dec. 10, we’ll make 900 sandwiches and trail mix immediately after both worship services. Sign-up to shop or deliver: in the Fellowship Lobby or at bit.ly/MTVol. Contact Barb Long. Name tags: If you need one, please sign up in the Narthex or send to hlatta@umtrinity.org. Next order will be placed Nov. 27! Online Giving: Fast. Easy. Convenient. GIVE ONLINE: umtrinity.org/give or TEXT TO GIVE: Simply send a text to 703-454-5532 with the amount you would like to contribute; include the dollar sign. Example: $25. You’ll receive a link to register. And then, you will receive a text verification and a receipt via email. For future giving, simply send a text with the amount you wish to give, and it will process automatically! Thanks for your continued support! Poinsettia Orders: Please find the order form in the pew. Orders are due Nov. 26 so that our supplier has time to provide enough beautiful plants for Trinity’s Sanctuary. This Month’s Collection: During the months of November and December, we are collecting tuna, rice in 2 lb. bags, cooking oil, canned beans, peanut butter, pasta and sauce, diapers (especially sizes 4-6), baby wipes, baby shampoo, diaper rash cream, toilet paper, paper towels, laundry and dish soap and Safeway/Giant gift cards for Share. Please place your donations in the bins outside the sanctuary and in the Fellowship Building. Please drop off Safeway/Giant gift cards in the church office. Adam, Alice Ann, Angela, Ann, Annie, Beth, Bobbie, Brian, Carl, David, Debbie, Doug & Sally, Frank, Gail & Hal, Gene, Gerry, Gray & Betty, Jen, Jenn, Joan, Karen, Katie, Kathie, Kathleen, Kenneth, Libbie, Liam, Liz, LJ, Marcia, Mark, Martha, Meak family, Michael, Norma, Parker, Paul& Jeannette, Peggy, Robert, Samuel, Sandy, Scott & Kathy, Theresa, Tony, Tommy, Woody and Yancey. We continue to pray for those seeking employment, college students, travelers, the people of the Gulf Coast states, California, Puerto Rico, the US Virgin Islands, Las Vegas, those impacted by natural disasters, rescue workers, those dealing with mental illness, our elected leaders, military families, immigrants and the people and communities affected by violence, including those in New York and Texas. This annual fund-raising event enables us to buy the supplies for the next year, so your participation is really important! All kinds of homemade foods and crafts for adults, children and pets will be available, all made by Trinity members. Our annual children’s event will be Sunday, Dec. 3, 1 – 3 p.m. Please register your children (ages 3-10) so that we may plan enough supplies for an exciting afternoon of activity and discovery. To register, look under Get Involved on our website: umtrinity.org. Pastors Jim Sprouse and Eileen Gilmer will each offer an Advent Study this year. Because of Bethlehem, a study by Max Lucado meets with Pastor Gilmer in Room 302 at 9:30 a.m. Pastor Sprouse will lead Down to Earth by Mike Slaughter on Sundays at 9:30 a.m., Mondays at 10 a.m. and Wednesdays at 6:30 p.m. beginning Dec. 3 when the current course of Disciple Fast Track is completed. The Share Angel Tree is in the Narthex with gifts tags and requests waiting to be picked up. Please note the instruction sheets also available under the tree. Gifts are due Dec 3. Meanwhile, we continue to work on comfort items for Fair Oaks Hospital on alternating Monday nights from 7 to 8:30 in Room 124. All adults welcome; instruction provided. Upcoming sessions: Nov. 20, Dec. 4 and Dec. 18. In addition the pillows, blankets, hats and baby caps we provide each month for Fair Oaks, we also recently delivered 25 fleece blankets to the Linus Project, which provides comfort blankets to local children and teens. In December, we will deliver 50 fleece Christmas stockings and Santa hats to be given to the babies born on or near Christmas. We need help with knitting or crocheting the hats, so if you can help, please contact Molly Sprouse, mollysprouse@gmail.com. Martha’s Table: On Dec. 10, we’ll make 900 sandwiches and trail mix immediately after the 8:30 worship service. Sign-up to shop or deliver: in the Fellowship Lobby or at bit.ly/MTVol. Contact Barb Long, bkalong@yahoo.com. Abby, Adam, Alice Ann, Amy, Andrew, Angela, Anne, Annie, Art, Ashley, Ben, Bill, Bobbie, Brian, Carl, Carla, Carol, Carolina, Chavez family, Chuck, Daniel, Dara, Darlene, David, Dean, Dorothy, Doug & Sally, Florian, Fordham family, Frances, Frank, Gene, Gerard, Gerry, Ginger, Gray & Betty, Holly, Janet, John, Julie, Juliet, Katie, Kate, Katherine, Kathie, Kathleen, Ken, Kenny, Kevin, Liam, Lilly, Lincoln, Linda, Liz, LJ, Marcia, Marian, Mark, Martha, Mary, Matt, Max, Meak family, Michael, Michelle, Norma, O’Brien family, Parker, Paul& Jeannette, Paula, Peggy, Phillip, Robert, Ryan family, Sally, Sandy, Sarkees, Scott & Kathy, Steve, Susan, Teddy, Theresa, Thomas, Tommy, Vivian, Woody and Yancey. 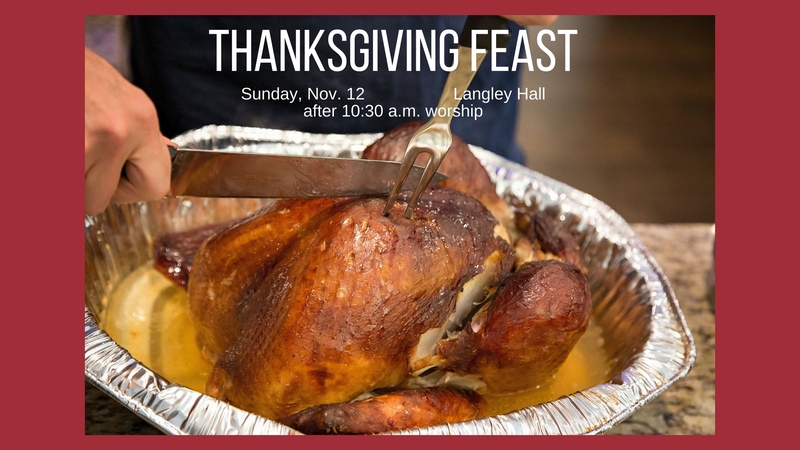 You are invited to Langley Hall with your favorite potluck dish. Please bring canned beans, 2 lb. bags of rice and peanut butter to be donated to Share, and plan to join us for this delicious feast. Sign-up sheets are in the Fellowship Lobby. Everyone is welcome! Pastors Jim Sprouse and Eileen Gilmer will each offer an Advent Study this year. Because of Bethlehem, a study by Max Lucado will begin this morning with Pastor Gilmer in Room 302 at 9:30 a.m. The other three sessions will be on Nov. 19, Dec. 3 and 10. Pastor Sprouse will lead Down to Earth by Mike Slaughter on Sundays at 9:30 a.m., Mondays at 10 a.m. and Wednesdays at 6:30 p.m. beginning Dec. 3 when the current course of Disciple Fast Track is completed. We will have a planning meeting for the Dec. 3 Advent Workshop. All interested volunteers are invited to join us by the couches in the Fellowship Lobby on Sunday at 9:30 a.m. The Share Angel Tree is in the Fellowship Lobby with gifts tags and requests waiting to be picked up. Please note the instruction sheets also available under the tree. Gifts are due Dec 3. This annual fund-raising event that enables us to buy the supplies for the next year, so your participation is really important! All kinds of homemade foods and crafts for adults, children and pets will be available, all made by Trinity members. Crafts for a Cause is gearing up for the annual Holiday Bazaar, which starts Sun., Nov. 19, and continues on Sundays through mid-December after both worship services. This is our sole fund-raising event that enables us to buy the supplies for the next year, so your participation is really important! All kinds of homemade foods and crafts for adults, children and pets will be available, all made by Trinity members. If you need one, please sign up in the Narthex or send to hlatta@umtrinity.org. Next order will be placed Nov. 27! Fast. Easy. Convenient. GIVE ONLINE: umtrinity.org/give or TEXT TO GIVE: Simply send a text to 703-454-5532 with the amount you would like to contribute; include the dollar sign. Example: $25. You’ll receive a link to register. And then, you will receive a text verification and a receipt via email. For future giving, simply send a text with the amount you wish to give, and it will process automatically! Thanks for your continued support! Please find the order form on our website or in the pew. Orders are due Nov. 26 so that our supplier has time to provide enough beautiful plants for Trinity’s Sanctuary. Throughout the year, Trinity Church collects specific items to help those who cannot provide them for themselves and their families. What we are collecting for our monthly drive is always listed in the Sunday bulletin. During the months of November and December, we are collecting tuna, rice in 2 lb. bags, cooking oil, canned beans, peanut butter, pasta and sauce, diapers (especially sizes 4-6), baby wipes, baby shampoo, diaper rash cream, toilet paper, paper towels, laundry and dish soap and Safeway/Giant gift cards for Share. Please place your donations in the bins outside the sanctuary and in the Fellowship Building. Please drop off Safeway/Giant gift cards in the church office. Grocery gift cards—Cards ($10, $20, & $25) are used to help the hungry who visit the church during the week looking for assistance. You may donate a card at anytime by dropping it in the offering plate or bringing it by the office. Some people prefer to write a check to the church and we purchase them in bulk. We ask that you only bring items that are requested. Other items are likely to be discarded. You are invited to Langley Hall with your favorite potluck dish. Please bring canned beans, 2 lb. bags of rice or peanut butter to be donated to Share, and plan to join us for this delicious feast. Sign-up sheets are in the Fellowship Lobby. Everyone is welcome! Advent Workshop Meeting: We will have a planning meeting for the Dec. 3 Advent Workshop. All interested volunteers are invited to join us by the couches in the Fellowship Lobby on Nov. 12 at 9:30 a.m. Meanwhile, we continue to work on comfort items for Fair Oaks Hospital on alternating Monday nights from 7 to 8:30 in Room 124. All adults welcome; instruction provided. Upcoming sessions: Nov. 6, Nov. 20, Dec. 4 and Dec. 18. Child Protection Training: The next in-person training session will be today in Room 301 at 9:30 a.m. To learn more: http://wp.me/p3ZFFv-jk. Contact Suzanne, suzyqrich@yahoo.com, 908-202-4227. Click the graphic to get a 2017 order form. Aid for Puerto Rico—The Missions Committee is assembling a suitcase of items for Jose Rivera to carry back to Puerto Rico and personally distribute to some in need. If you want to contribute items – please put them in the Missions (Honduras) bin in the Fellowship Lobby by Sunday, November 5. Items requested: AA and D batteries, new power cords (orange), battery powered fans, small LED type flashlights and bug repellent (non-aerosol – wipes preferred). Why does Trinity Church exist? According to Matthew’s Gospel, the reason is made clear – we are to “Go and make disciples of all nations, baptizing them in the name of the Father and of the Son and of the Holy Spirit, and teaching them to obey everything I have commanded you.” Matthew 28:19-20. Based on the Great Commission, Trinity Church follows the stated purpose of the United Methodist Church, “to make disciples of Jesus Christ for the transformation of the world.” The mission of our congregation from our Next Level Innovation weekend is Bridging God’s Word into Everyday Life. I see this as a four-fold task. First: we reach out to people and welcome them into Trinity Church. We have the missional challenge of connecting our church to the world around our facilities, and the communities where we work, play, shop, study, and worship. We have the missional challenge of connecting our church to all the hurts, doubts and questions of the people around us. Our mission is to find them, reach out to them, listen to them, accept them and share the gospel in word and deed. Second: we relate to people and help them deepen their spiritual relationship with God. Trinity does this by providing opportunities for growing closer to God. Whether guests or long-time members, we all need God’s love in Christ. Through worship, prayer, study, honest sharing, and finding where God needs us to be in mission – we help each other discover that the Holy Spirit is not far off but a present reality among us. We need to encourage each other to give our lives to Christ, and to center our lives in a very real, living and present God. Third: we nurture people in Christian lifestyle. Trinity Church helps people practice the disciplines of discipleship. Our church exists to serve not be served. We gather for worship not only for our own personal spiritual formation and growth, but also to prepare and equip ourselves for doing the work of love and be Christ’s disciples in our community and world. We are strengthened for ministry through worship, baptism, Communion, Bible study, prayer and all other means of grace. Fourth: we support people in their ministry. As members of Trinity Church, we’re sent into our community and world to serve others in need and make our community and world more loving and just. We believe the Holy Spirit empowers and guides us. Where ever we go we can expect to meet Christ already at work. Our congregation exists, in part, to surround and support each other in her and his ministry. With the loving support of this kind of community we can continue to grow and reach others for Christ. All this is the missional challenge of the church and Trinity Church. The only mission that counts is God’s mission. We need to view the world and Christ’s mission in a new light. We no longer look at the world for any gaps in mission so we can take God to where God isn’t now. Instead, let’s look at the world as God’s- a place where God’s love and care are already, and everywhere, at work. We don’t take mission outside Trinity’s walls – we go out to meet the mission already there. How did it get to be November? I know I ask myself this question each year. As we move closer to Advent, I have two great opportunities for you. They offer ways to nourish and renew; one is for others and one is for you. In this busy time of year, I hope you’ll find space in your schedule to take part. The first is Rise Against Hunger. (That’s the new name for Stop Hunger Now.) This is a wonderful project that helps feed the hungry across the globe. Families are welcome to attend. (Children should be ages four and up.) It’s a good opportunity for multi-generational service. Rise Against Hunger is an international hunger relief organization that helps impoverished people throughout the world. Trinity has supported this effort for several years. Our goal is to make 300,000 meals at our McLean event. The meal packages we assemble that day will be sent to Nicaragua, which was ravished by Hurricane Nate. Come join people from all over the area to help! Shifts start at 8 a.m., 11 a.m. and 2 p.m. The second event is an Advent Bible study. It’s based on Max Lucado’s book Because of Bethlehem. Cokesbury publishers describes the Bible study this way: Because of Bethlehem, God knows what it is like to be a human. When we talk to God about our challenges, our struggles, and our tough times, God understands, because he’s been there. God’s been here. This Advent study will remind us of these truths and give us hope. I have some books ordered, so if you would like one let me know. They are also offered through Amazon or Cokesbury.com. I’m convinced that technology will help the church overcome present and future challenges. Initially for this article I wanted to show an example of how technology and data science in sports have transformed two of the most cursed organizations. However, in my research I found that the church has something far greater to offer: people with character who overcome adversities, failures, and hardships. Have you heard about the ‘Curse of the Bambino’ or the ‘Curse of the Billy Goat’? These were superstitious explanations about the Boston Red Sox and the Chicago Cubs not being able to win the World Series for the longest time; for Boston it was 86 years and Chicago 108 years. But one person is credited in ending curses for both teams, Theo Epstein. When he started out in Boston, he was committed to using data analysis and latest technological advances. For example, Red Sox interns went to NCAA headquarters in Indianapolis to examine 30 years’ worth of college baseball stats to look for characteristics of college players who became productive major leaguers. They worked with neuroscientists to study the brain makeup of great hitters. The Boston Red Sox’s success was mainly credited to Epstein’s commitment to ‘Moneyball’ (the data analysis approach to sports). However, he hit a snag. He found that winning and success were only parts of the solution. Something far greater was in need- athletes with character. When the Red Sox team that won two World Series had an embarrassing late season collapse in 2011, Mr. Epstein observed that even though players looked great on paper, some of them had serious character flaws. Therefore, when he started to work for the Cubs he placed an upmost importance on character. Instead of just looking at numbers and analytical data, he asked his scouts to examine adversities that prospective athletes had to overcome on and off the field. Moreover, his scouts were instructed to ask potential recruits’ friends, coworkers and family members these questions: How does he treat people when no one’s looking? What do his friends say about him? What do his enemies say about him? How does he treat people he doesn’t necessarily have to treat well? He wanted to emphasize that the heart and soul of an athlete are greater than the sum of the physical attributes. As I stated previously I wanted to highlight the importance of using technology to overcome some of the challenges that Trinity faces. I still believe that because businesses, government agencies, sports teams, and non-profits that skillfully employ science and big data will move forward. Moreover, Mr Epstein’s experiences help me to appreciate that the core mission of the church is still to meet the core needs of humanity, building character. Through researching about Mr. Epstein, I learned, Yes! Technology is needed in the church. It’s needed so that we could continue to make disciples of Jesus who bear the cross to overcome injustice, apathy, and violence through godly character, perseverance, and faithfulness.